Each of us have special dates we celebrate on an annual basis — birthdays, anniversaries and other special holidays. For the cow herd, notable dates might include the start of calving or breeding season and weaning. 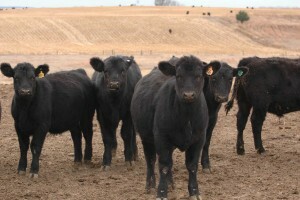 An undervalued date in cow-calf production is the start of the third trimester. Off the top of your head and without calculating back from calving, do you know when the third trimester starts for your replacement heifers or cows? I’m guessing it’s not on many people’s radar. If you have a March 1 calving herd with replacements calving before cows, the third trimester starts for both in November. Technology has been developed that makes many things in our lives much easier. Some of you may remember when you were the “remote control” when your Dad was watching TV. Now, new homes have heating, alarm and lighting systems throughout that can be controlled remotely with a smart phone. Cattle producers use electronic IDs to automate many data collection activities. Computer applications seem to only be limited by our imagination. Our beef extension educational efforts have often pointed out timely management topics. For example, now is the time to sample harvested forages and get an analysis of the quality. Some of those items would relate to time of year, while others would depend on the individual operation’s calving and breeding dates. So, while those suggestions are timely for most (we hope), they certainly do not fit everyone. Weaning is just around the corner for many spring-calving operations. The process of weaning calves essentially has 3 primary components: 1) maternal separation 2) moving to a new environment with a new social structure and 3) becoming accustomed to new, unfamiliar feedstuffs. How we manage all of these sources of stress or components of the weaning process ultimately impacts calf health and performance. However, one of the most critical elements of a successful weaning program is getting calves to consume feed. The first step in managing feed intake of calves is getting them to the bunk.